Guests who visit Walt Disney World love to eat and luckily there are a ton of options for guests to enjoy! Throughout the four theme parks, two water parks, Downtown Disney, and Disney Resorts there are countless restaurants to choose from. While guests enjoy full service meals every now and again, they also appreciate the ease and convenience of quick service meals as well. Throughout Walt Disney World there are plenty of quick service locations which shouldn’t be missed that serve up some amazing options. Guests who are partaking in the Disney Dining Plan should also pay particular attention to several quick service restaurants as they offer up some of the best meals for a guest’s money. By simply checking out the prices of options available in each quick service dining location guests can be sure to get the most out of each dining credit used. Here are the top ten quick service dining plan meals at Walt Disney World. 10. Sleepy Hollow $10.98 – One of the most underrated quick service dining locations in the Magic Kingdom can be found just over the bridge connecting the hub to Liberty Square. Sleepy Hollow serves up delicious breakfast, lunch, and dinner options that guests can’t find elsewhere in the park. Guests using a quick service dining credit should enjoy the $6.79 Waffle with Strawberries and Whipped Cream with a $4.19 Ice Cream Cookie Sandwich for dessert. 9. Yak & Yeti Local Food Cafes $14.98 – In the Asia section of Disney’s Animal Kingdom is a quick service dining location that offers Asian fare sure to please every guest. Open for lunch and dinner guests should enjoy the $10.99 Teriyaki Beef Bowl that comes served with carrots, snap peas, mushrooms, and white rice. For dessert guests can order either Pineapple Coconut Cake, Triple Chocolate Mousse, or a Minute Maid Frozen Lemonade Cup for $3.99. 8. Columbia Harbour House $16.78 – One of the best quick service restaurants in the Magic Kingdom can be found across from the Haunted Mansion in Liberty Square. Columbia Harbour House serves up traditional seafood options that can’t be found elsewhere in the park and features a nautical theme. Guests who dine there can enjoy dark wood paneling, nautical artwork and props, and a second floor with windows overlooking the streets of Liberty Square. The restaurant is open daily for lunch and dinner and guests who are looking to get the best value out of their quick service dining credit should visit during dinner and order the $12.49 Grilled Salmon which is served with couscous and steamed broccoli. The best dessert options are the Seasonal Cobbler or Chocolate Cake both costing $4.29. 7. The Mara $17.48 – Guests who are staying at or visiting Disney’s Animal Kingdom Lodge can enjoy a quick service location which serves up some traditional African cuisine alongside American classics. The Mara is open daily for all three meals and is decorated to make guests feel as though they are dining on the savannah. Guests using a quick service dining credit should order the $12.49 Salmon and save room for the $4.99 Zebra Cupcake. 6. Sunshine Seasons $17.98 – A quick service restaurant in Epcot’s Future World which serves up some of the freshest food around can be found on the lowest level of The Land Pavilion right across from Soarin’ and Living with the Land. Sunshine Seasons is a massive restaurant with several different counters to order from and tables that are situated in the open air atrium of the pavilion. Guests can enjoy breakfast, lunch, and dinner at Sunshine Seasons and dine on fresh produce that was grown in the greenhouses of The Land. The best meal to order with a quick service dining plan credit is the Slow Roasted Pork Chop that is $12.99 and comes served with cheddar mashed potatoes, barbecue sauce, and corn on the cob. For desert guests should order either the Chocolate Mousse Cake, Carrot Cake Cupcake, or Tiramisu which all cost $4.99. 5. Pecos Bill Tall Tale Inn and Café $19.48 – Guests who are looking to enjoy some Southwestern cuisine in the Magic Kingdom should head over to Frontierland and enjoy a meal at Pecos Bill Tall Tale Inn Café. The restaurant is massive and features one dining room which allows guests to feel like they are dining outside in a quaint courtyard. Open for lunch and dinner daily, guests should order the Steak Fajita Platter for $14.49 which comes served with cilantro rice, beans, and a tortilla. For dessert guests should indulge in the $4.99 churros. 4. Be Our Guest Restaurant $20.58 – Located in the Magic Kingdom’s New Fantasyland, Be Our Guest Restaurant invites guests into the Beast’s Castle to enjoy a meal while feeling like royalty. Guests can dine in ether the Grand Ballroom, West Wing, or Castle Gallery and feel as though they have stepped into the film Beauty and the Beast. The restaurant is unique in that breakfast and lunch are served up as quick service meals but dinner is a full service affair. Guests should order up the $ 15.99 Tuna Nicoise Salad which is served warm with green beans, potatoes, olive, peppers, tomatoes, and a poached egg. For desert guests can select from a number of cupcakes all priced at $4.59 including The Master’s Cupcake and a Lemon Meringue Cupcake. 3. Flame Tree Barbecue $20.78 – Guests who visit Disney’s Animal Kingdom and find themselves on Discovery Island end up smelling the delicious aroma of barbecue before even arriving at Flame Tree Barbecue. The quick service restaurant serves up traditional St. Louis barbecue options for lunch and dinner and the best meal to order is the $16.19 Ribs and Chicken Combo which is served with baked beans and jalapeño cornbread. For dessert guests can enjoy either the Chocolate Mousse or the Lime Mousse which are both $4.59. 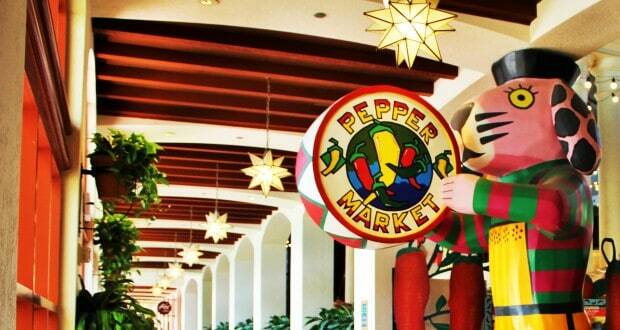 Disney’s Coronado Springs Resort is home to the quick service dining location Pepper Market which serves up traditional Mexican fare alongside American favorites. Open daily for breakfast, lunch, and dinner, guests can dine in a colorful and festive area that feels like an open air market. Guests should order the BBQ Ribs for $14.99 which come served with potatoes, vegetables, and a cornbread muffin. For dessert guests can enjoy a $6.99 Fruit and Yogurt Parfait. A favorite quick service dining location of many guests in Disney Springs is the Wolfgang Puck Express at Disney Springs Marketplace. Guests looking to get the best value for their quick service dining credit should order the $20.00 Oven Roasted Salmon served with cauliflower puree, marinated potatoes, and broccolini and then enjoy either the Crème Brulee with Berries or the Vanilla Bean Cheesecake which are both $6.00.